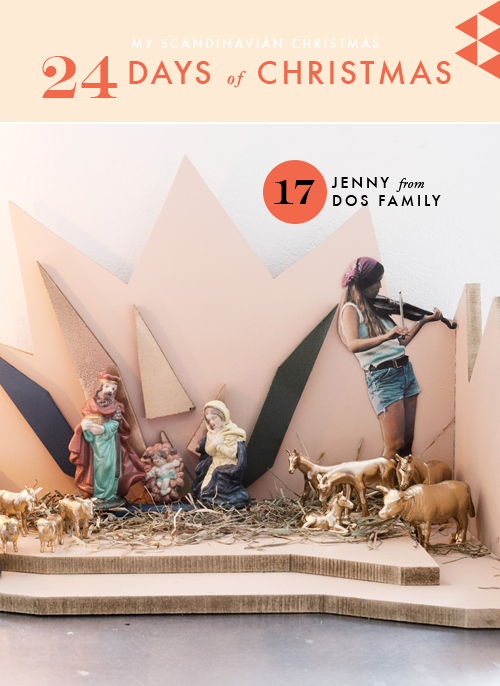 Day 17 of My Scandinavian Christmas is with one of my favorites, Jenny from Dos Family. Jenny’s a photographer in Southern Sweden and she shares her blog with Isabelle McAllister. Their blog is a fantastical little world of creativity. Welcome, Jenny! Sara and Kristian Ingers are a super creative couple. 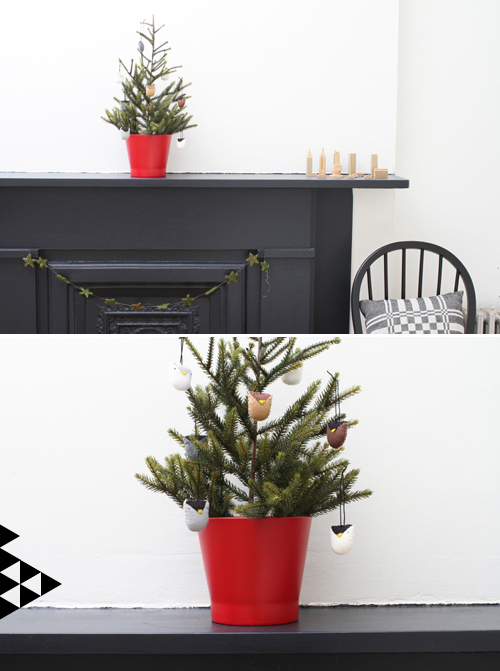 I have photographed their home for the blog and this christmas I went back to document some of their Christmas deco. Sara and Kristian decided on an alternative nativity this year. They made the design together and then Kristan, who is a wood shop teacher at school, put it together. I love how they painted the sheep golden and added a modern goat herder. I LOVE this! I love when people put their own spin on an old tradition. Thank you Jenny for participating in My Scandinavian Christmas! 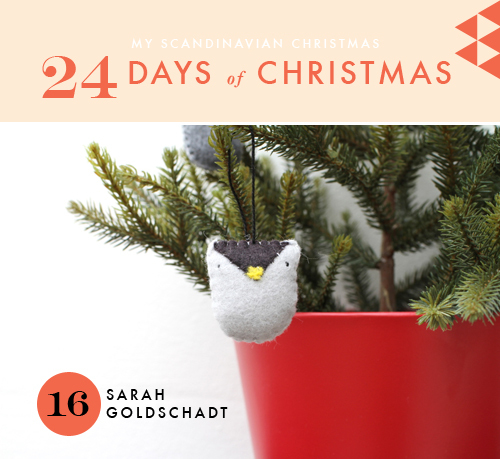 Day 16 of My Scandinavian Christmas is from the lovely Sarah Goldschadt. Sarah has appeared on Lars before (the first Craftenhagen! Danish Christmas hearts! Mini knitted houses!) and I’m lucky to have this Danish/American crafter extraordinaire and author of Craft-a-day on the blog once more. This is the first year I won’t be in Minnesota for Christmas. I’ll miss the real Christmas tree filled with gifted and handmade ornaments over the years, the wooden Santa and his reindeer sleigh my grandfather cut out of wood on display on the mantel, the felt stockings my sister and I decorated with beads and sequins hung by the fireplace, and the trail of paper “nisse” that comes out every year. But I’ll be celebrating with my boyfriend Ben and starting our own traditions. First project was decorating the Ikea Christmas tree (who knew the fake ones could look so great!) with tiny owl ornaments from my book, Craft-a-Day. I’ll also see if I can fake a vegetarian friendly frikadeller, but most importantly I’ll be making my favorite Jul dessert: risalamande. It’s tradition to serve it with sliced almonds and hide one whole almond in it. The person who gets the whole almond wins a prize! P.S. 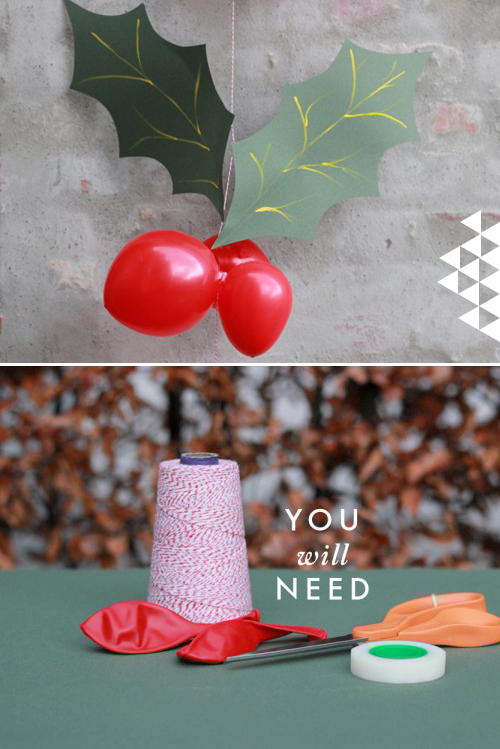 If you’re looking for some winter crafts, check out the Winter Edition Craft-a-Day iPad app! Thank you so much Sarah for participating in My Scandinavian Christmas. Be sure to check out her lovely blog. 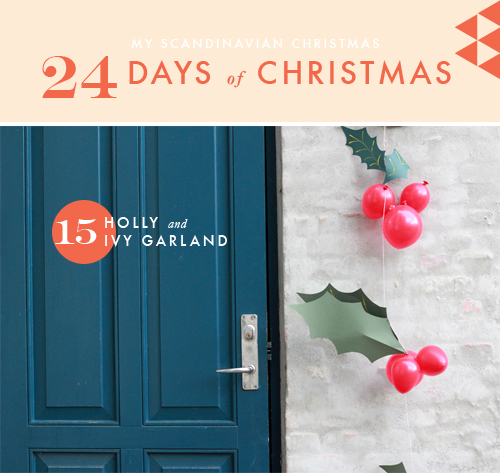 Day 15 of My Scandinavian Christmas is with….drumroll…me! 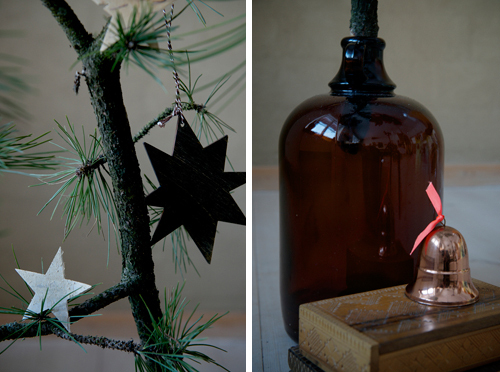 Check out the other guest contributors to My Scandinavian Christmas here. There are some pretty awesome blogger and projects. 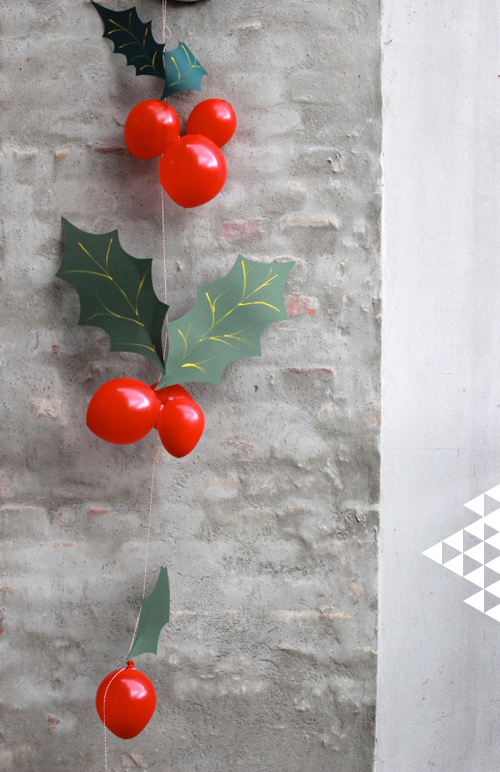 Ok, this holly and ivy balloon garland is not Scandinavian at all, but it’s one that I recently did for Hello Bee and it’s a super easy Christmas decoration to make for a party or for kids. I modeled it after my fruit balloon DIY. It’s pretty much the same concept, but with different shapes. Step 1: Blow up some balloons aso they are small enough to group in small clumps as berries. 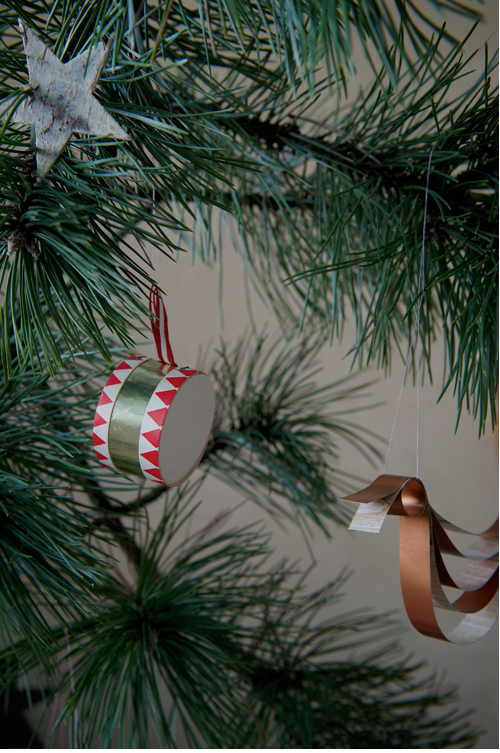 Step 2: With scotch tape or double-sided stick tape attach a little to the balloon and stick to another. Clump in threes or twos. 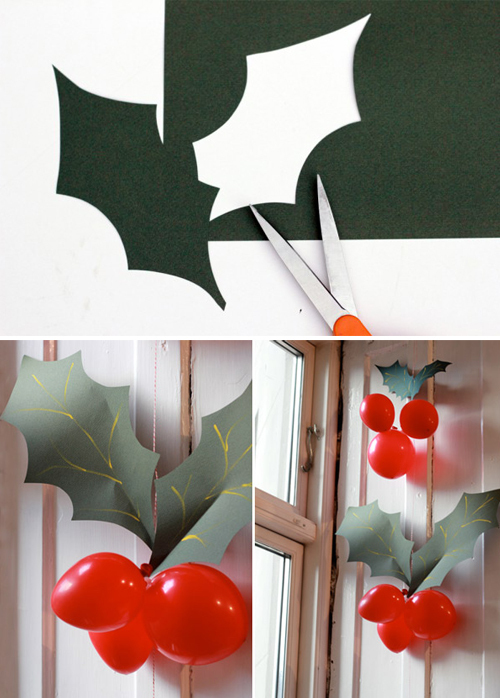 Step 3: Cut out holly leaves in proportion to the size of the balloons. Draw or paint yellow veins on the leaves. Step 4: Tie the groups of berries onto the twine and leave extra twine at the front and back. Step 5: Glue gun the edges of the leaves to the edge of the balloon and a bit to the twine to secure it in place. Donzo! That’s it! So simple! 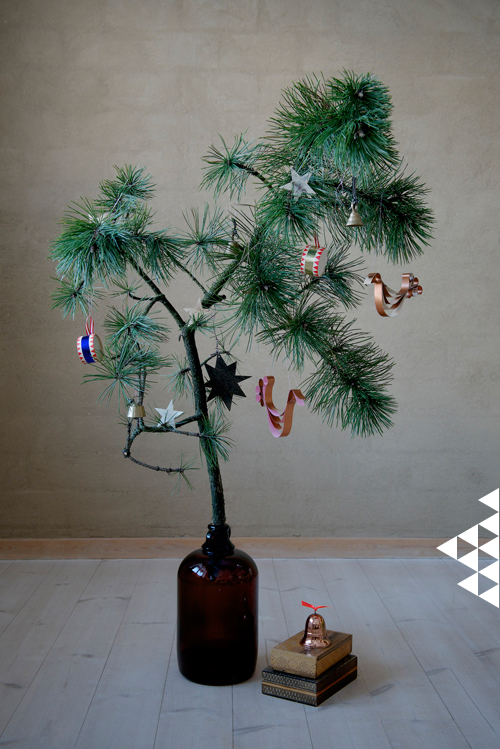 Check out the rest of the amazing Christmas stories and projects for My Scandinavian Christmas here. We’re on American soil and it feels good! Sunshine on my face, In-n-Out in my belly–life is good! 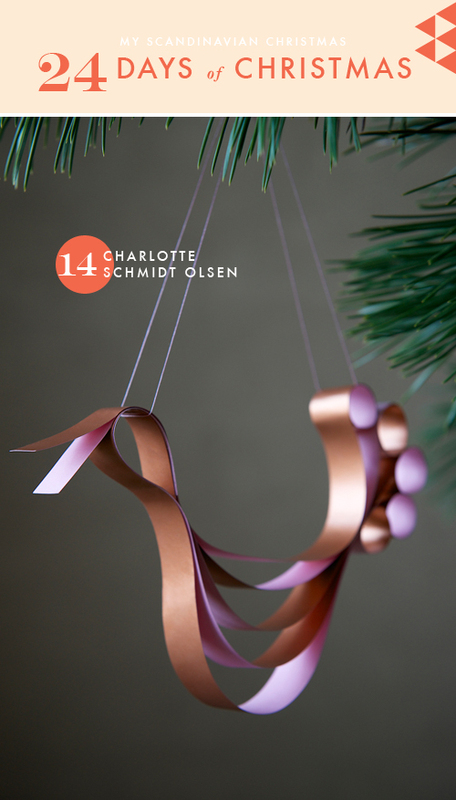 Day 14 of My Scandinavian Christmas is with the wonderful photographer, Charlotte Schmidt Olsen. Charlotte and I met a few months ago at Craftenhagen through crafter of Sarah Goldschadt. 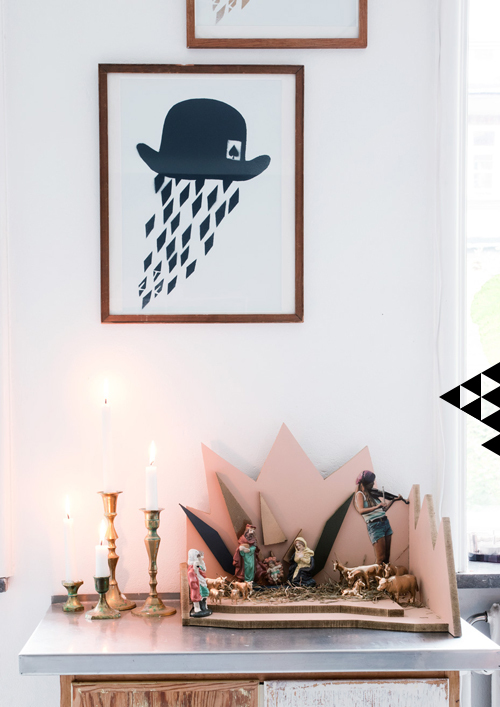 Charlotte is a crafter/photographer in Denmark who does fancy shoots for magazines like Bolig Liv and Alt for Damerne. I’m so glad to have her here! I was so glad when Brittany asked me to join her countdown to Scandinavian Christmas. It made me think of my Christmases growing up in the seventies. I found a pattern that resembles this time to me. We did not have this bird at my home, but we had a lot that was along the same theme. We always made decorations for the home, a tree, and a lot of biscuits and coloured marzipan figures. I still love to do that. I find doing creative stuff with family and friends wonderful! For the bird I wanted to use copper-coloured paper, it is a colour that has recently court my eye. I found some wrapping paper, coloured paper and a page from a magazine. I used two different colours to make it sparkle. I put the birds on a small pine branch but in a window would be just a suited. Thank you so much Charlotte for participating in My Scandinavian Christmas. I’m looking forward to your visit (that’s a hint!). Check out her photography site here. 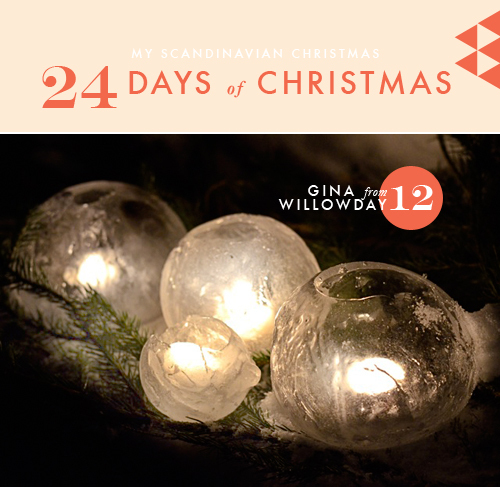 Day 12 of My Scandinavian Christmas is with Gina of Willowday based out of Stockholm, Sweden. Gina has some of the most clever DIYs and I’m so glad she’s with us today. It’s an honor to be a part of the Brittany’s My Scandinavian Christmas. Contributing from Sweden, I thought instantly of lights and candles. These play a prominent roll in Swedish holiday decoration from the hanging paper stars in windows to Advent Candelabras and candles; right down to the Candle Crown worn by Lucia, which she wears ceremoniously as she brings in the sun at dawn on December 13 for the holiday of St. Lucia. Candles and lights are not restrained to the indoors. 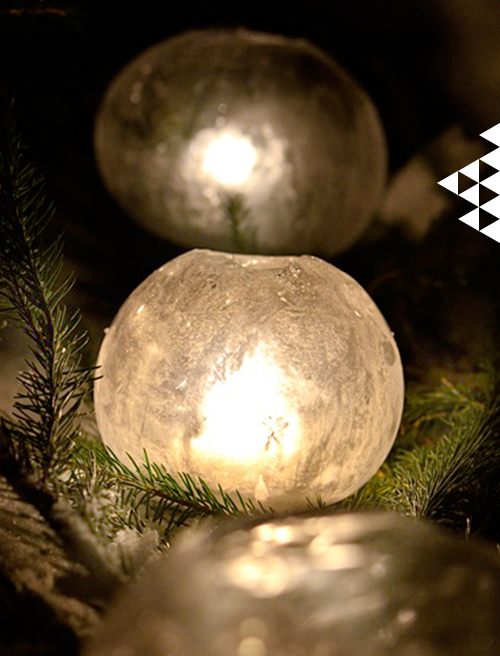 During my first Swedish Christmas, before we sat down to enjoy our Christmas Eve feast, several snow ball lanterns were built outdoors, just outside the dining room window for the final ambiance. Today, in my home, we make Ice Lanterns. I’m happy to share them with you here, today. These are both a fantastic outdoor project with kids or to made conveniently in the comfort of your home and stored until the party. For an Ice Lantern tutorial, click here. Thank you Brittany for this Swedish-Danish Christmas interlude here with you. Thank you, Gina, for participating! Check out her blog, Willowday here.